by Mary Ellen Copeland, Ph.D., and Shery Mead, M.S.W. This article was original published on this site in February 2000. Recovery has only recently become a word used in relation to the experience of psychiatric symptoms. Those of us who experience psychiatric symptoms are commonly told that these symptoms are incurable, that we will have to live with them for the rest of our lives, that the medications, if they (health care professionals) can find the right ones or the right combination, may help, and that we will always have to take the medications. Many of us have even been told that these symptoms will worsen as we get older. Nothing about recovery was ever mentioned. Nothing about hope. Nothing about anything we can do to help ourselves. Nothing about empowerment. Nothing about wellness. 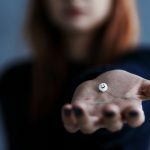 When I was first diagnosed with manic depression at the age of 37, I was told that if I just kept taking these pills – pills that I would need to take for the rest of my life – I would be OK. So I did just that. And I was “OK” for about 10 years until a stomach virus caused severe lithium toxicity. After that I could no longer take the medication. During the time I was taking the medication I could have been learning how to manage my moods. I could have been learning that relaxation and stress reduction techniques and fun activities can help reduce the symptoms. I could have been learning that I would probably feel a lot better if my life wasn’t so hectic and chaotic, if I wasn’t living with an abusive husband, if I spent more time with people who affirmed and validated me, and that support from other people who have experienced these symptoms helps a lot. I was never told that I could learn how to relieve, reduce and even get rid of troubling feelings and perceptions. Perhaps if I had learned these things and had been exposed to others who where working their way through these kinds of symptoms, I would not have spent weeks, months and years experiencing extreme psychotic mood swings while doctors searched diligently to find effective medications. Now the times have changed. Those of us who have experienced these symptoms are sharing information and learning from each other that these symptoms do not have to mean that we must give up our dreams and our goals, and that they don’t have to go on forever. We have learned that we are in charge of our own lives and can go forward and do whatever it is we want to do. People who have experienced even the most severe psychiatric symptoms are doctors of all kinds, lawyers, teachers, accountants, advocates, social workers. We are successfully establishing and maintaining intimate relationships. We are good parents. We have warm relationships with our partners, parents, siblings, friends and colleagues. We are climbing mountains, planting gardens, painting pictures, writing books, making quilts, and creating positive change in the world. And it is only with this vision and belief for all people that we can bring hope for everyone. Sometimes our health care professionals are reluctant to assist us in this journey – afraid that we are setting ourselves up for failure. But more and more of them are providing us with valuable assistance and support as we make our way out of the system and back to the life we want. Recently I (Mary Ellen) spent a full day visiting with health care professionals of all kinds at a major regional mental health center. It was exciting to hear over and over the word “recovery”. They were talking about educating the people they work with, about providing temporary assistance and support for as long as is necessary during the hard times, about working with people to take responsibility for their own wellness, exploring with them the many options available to address their symptoms and issues and then sending them on their way, back to their loved ones and into the community. A word that these dedicated health care professionals used over and over again was “normalize”. They are trying to see for themselves, and help the people they work with to see, these symptoms on a continuum of the norm rather than an aberration – that these are symptoms that everyone experiences in some form or other. That when, either from physical causes or stress in our lives, they become so severe that they are intolerable, we can work together to find ways to reduce and relieve them. They are talking about less traumatic ways to deal with crises where symptoms become frightening and dangerous. They are talking about respite centers, guest homes and supportive assistance so a person can work through these hard times at home and in the community rather than in the frightening scenario of a psychiatric hospital. What Are the Key Facets of a Recovery Scenario? There is hope. A vision of hope that includes no limits. That even when someone says to us, “You can’t do that because you’ve had or have those symptoms, dear!” – we know it’s not true. It is only when we feel and believe that we are fragile and out of control that we find it hard to move ahead. Those of us who experience psychiatric symptoms can and do get well. I (Mary Ellen) learned about hope from my mother. She was told she was incurably insane. She had wild, psychotic mood swings unremittingly for eight years. And then they went away. After that she worked very successfully as a dietitian in a large school lunch program and spent her retirement helping my brother raise seven children as a single parent and volunteering for a variety of church and community organizations. We don’t need dire predictions about the course of our symptoms – something which no one else, regardless of their credentials can ever know. We need assistance, encouragement and support as we work to relieve these symptoms and get on with our lives. We need a caring environment without feeling the need to be taken care of. Too many people have internalized the messages that there is no hope, that they are simply victims to their illness, and that the only relationships they can hope for are one-way and infantalizing. As people are introduced to communities and services that focus on recovery, relationships change to being more equal and supportive in both directions. As we feel valued for the help we can offer as well as receive, our self-definitions are expanded. We try out new behaviors with each other, find ways in which we can take positive risks and find that we have more self-knowledge and more to offer than we were led to believe. It’s up to each individual to take responsibility for their own wellness. There is no one else who can do this for us. When our perspective changes from reaching out to be saved to one in which we work to heal ourselves and our relationships, the pace of our recovery increases dramatically. Taking personal responsibility can be very difficult when symptoms are severe and persistent. In these cases, it is most helpful when our health care professionals and supporters work with us to find and take even the smallest steps to work our way out of this frightening situation. Education is a process that must accompany us on this journey. We search for sources of information that will help us to figure out what will work for us and the steps we need to take in our own behalf. Many of us would like health care professionals to play a key role in this educational process – directing us to helpful resources, setting up educational workshops and seminars, working with us to understand information, and helping us to find a course that resonates with our wishes and beliefs. Each of us must advocate for ourselves to get what it is we want, need and deserve. Often people who have experienced psychiatric symptoms have the mistaken belief that we have lost our rights as individuals. As a result, our rights are often violated, and these violations are consistently overlooked. Self-advocacy becomes much easier as we repair our self-esteem, so damaged by years of chronic instability, and come to understand that we are often as intelligent as anyone else, and always as worthwhile and unique, with special gifts to offer the world, and that we deserve all the very best that life has to offer. It is also much easier if we are supported by health care professionals, family members and supporters as we reach out to get our personal needs met. creating the life of their choice. Mutual relationship and support is a necessary component of the journey to wellness. The nationwide focus on peer support is a result of the recognition of the role of support in working toward recovery. Throughout New Hampshire, peer support centers are providing a safe community where people can go even when their symptoms are most severe, and feel safe and secure. Beyond this, peer support holds few, if any, assumptions about people’s capabilities and limits. There is no categorizing and no hierarchical roles (eg. doctor/patient), with the result being that people move from focusing on themselves to trying out new behaviors with one another and ultimately committing to a larger process of building community. The crisis respite center at Stepping Stones Peer Support Center, in Claremont, New Hampshire, carries this concept a step further by providing around-the-clock peer support and education in a safe, supportive atmosphere. Instead of feeling out of control and pathologized, peers support one another in moving through and beyond difficult situations, and help each other learn how crisis can be an opportunity for growth and change. An example of this was when a member who was having lots of difficult thoughts came into the center to avoid hospitalization. His goal was to be able to talk through his thoughts without feeling judged, categorized or told to increase his medication. After several days he went home feeling more comfortable and connected to others with whom he could continue to interact. He committed to staying in and expanding on the relationships that he built while in the respite program. Through the use of support groups and building community that defines itself as it grows, many people find that their whole sense of who they are expands. As people grow they move ahead in other parts of their lives. Support, in a recovery based environment, is never a crutch or a situation in which one person defines or dictates the outcome. Mutual support is a process in which the people in the relationship strive to use the relationship to become fuller, richer human beings. Although we all come to relationships with some assumptions, support works best when both people are willing to grow and change. This need for mutual and appropriate support extends into the clinical community. Though clinical relationships may never truly be mutual, or without some assumptions, we can all work to change our roles with each other in order to further move away from the kinds of paternalistic relationships some of us have had in the past. How much of our own discomfort are we willing to sit with while someone is trying out new choices? How are our boundaries continuously being redefined as we struggle to deepen each individual relationship? What are the assumptions we already hold about this person, by virtue of his/her diagnosis, history, lifestyle? How can we put aside our assumptions and predictions in order to be fully present to the situation and open to the possibility for the other person to do the same? What are the things that might get in the way of both of us stretching and growing? Support begins with honesty and a willingness to revisit all of our assumptions about what it means to be helpful and supportive. Support means that at the same time clinicians hold someone in “the palm of their hand,” they also hold them absolutely accountable for their behavior and believe in their ability to change (and have the same self-reflective tools to monitor themselves). No one is beyond hope. Everyone has the ability to make choices. Even though health care professionals have traditionally been asked to define treatment and prognosis, they have to look through the layers of learned helplessness, years of institutionalization, and difficult behaviors. Then they can creatively begin to help a person reconstruct a life narrative that is defined by hope, challenge, accountability, mutual relationship and an ever changing self-concept. As part of our support system, health care professionals need to continue to see if they are looking at their own roadblocks to change, understand where they get “stuck” and dependent, and look at their own less than healthy ways of coping. Health care professionals need to relate to us that they have their own struggles and own that change is hard for all. They need to look at our willingness to “recover” and not perpetuate the myth that there is a big difference between themselves and people they work with. Support then becomes truly a mutual phenomenon where the relationship itself becomes a framework in which both people feel supported in challenging themselves. The desire to change is nurtured through the relationship, not dictated by one person’s plan for another. The outcome is that people don’t continue to feel separate, different and alone. How Can Health Care Professionals Address Learned Helplessness? Clinicians often ask us, “What about people who aren’t interested in recovery, and who have no interest in peer support and other recovery concepts?” What we often forget is that MOST people find it undesirable to change. It’s hard work! People have gotten used to their identities and roles as ill, victims, fragile, dependent and even as unhappy. Long ago we learned to “accept” our illnesses, give over control to others and tolerate the way of life. Think how many people live like this in one way or another that don’t have diagnosed illnesses. It’s easier to live in the safety of what we know, even if it hurts, than it is to do the hard work of change or develop hope that conceivably could be crushed. Our clinical mistake, up to this point, has been thinking that if we ask people what they need and want, they will instinctively have the answer AND want to change their way of being. People who have been in the mental health system for many years have developed a way of being in the world, and particularly being in relationship with professionals, where their self-definition as patient has become their most important role. Our only hope for accessing internal resources that have been buried by layers of imposed limitations is to be supported in making leaps of faith, redefining who we’d like to become and taking risks that aren’t calculated by someone else. We need to be asked if our idea of who we’d like to become is based on what we know about our “illnesses”. We need to be asked what supports we would need to take new risks and change our assumptions about our fragility and our limitations. When we see our closest friends and supporters willing to change, we begin to try out our own incremental changes. Even if this means buying ingredients for supper instead of a TV dinner, we need to be fully supported in taking the steps to recreating our own sense of self and be challenged to continue to grow. Recovery is a personal choice. It is often very difficult for health care providers who are trying to promote a person’s recovery when they find resistance and apathy. Severity of symptoms, motivation, personality type, accessibility of information, perceived benefits of maintaining the status quo rather than creating life change (sometimes to maintain disability benefits), along with the quantity and quality of personal and professional support, can all effect a person’s ability to work toward recovery. Some people choose to work at it very intensively, especially when they first become aware of these new options and perspectives. Others approach it much more slowly. It is not up to the provider to determine when a person is making progress – it is up to the person. What Are Some of the Most Commonly Used Recovery Skills and Strategies? reaching out for support: connecting with a non-judgmental, non-critical person who is willing to avoid giving advice, who will listen while the person figures out for themselves what to do. being in a supportive environment surrounded by people who are positive and affirming, but at the same time are direct and challenging; avoiding people who are critical, judgmental or abusive. peer counseling: sharing with another person who has experienced similar symptoms. 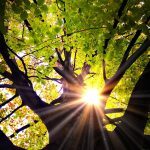 stress reduction and relaxation techniques: deep breathing, progressive relaxation and visualization exercises. exercise: anything from walking and climbing stairs to running, biking, swimming. creative and fun activities: doing things that are personally enjoyable like reading, creative arts, crafts, listening to or making music, gardening, and woodworking. journaling: writing in a journal anything you want, for as long as you want. dietary changes: limiting or avoiding the use of foods like caffeine, sugar, sodium and fat that worsen symptoms. exposure to light: getting outdoor light for at least 1/2 hour per day, enhancing that with a light box when necessary. learning and using systems for changing negative thoughts to positive ones: working on a structured system for making changes in thought processes. increasing or decreasing environmental stimulation: responding to symptoms as they occur by either becoming more or less active. daily planning: developing a generic plan for a day, to use when symptoms are more difficult to manage and decision making is difficult. crisis planning to maintain control even when the situation is out of control. 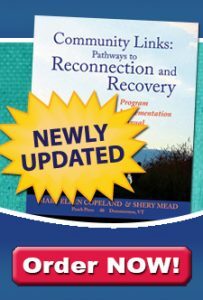 In self-help recovery groups, people who experience symptoms are working together to redefine the meaning of these symptoms, and to discover skills, strategies and techniques that have worked for them in the past and that could be helpful in the future. What Is the Role of Medication in the Recovery Scenario? Many people feel that medications can be helpful in slowing down the most difficult symptoms. While in the past, medications have been seen as the only rational option for reducing psychiatric symptoms, in the recovery scenario, medications are one of many options and choices for reducing symptoms. Others include the recovery skills, strategies and techniques listed above, along with treatments that address health related issues. Though medications are certainly a choice, these authors believe that medication compliance as the primary goal is not appropriate. People who experience psychiatric symptoms have a hard time dealing with the side-effects of medications designed to reduce these symptoms – side effects like obesity, lack of sexual function, dry mouth, constipation, extreme lethargy and fatigue. In addition, they fear the long term side-effects of the medications. Those of us who experience these symptoms know that many of the medications we are taking have been on the market for a short time – so short that no one really knows the long term side-effects. We know that Tardive’s Dyskinesia was not recognized as a side-effect of neuroleptic medication for many years. We fear that we are at risk of similar irreversible and destructive side-effects. We want to be respected by health care professionals for having these fears and for choosing not to use medications that are compromising the quality of our lives. When people who have shared similar experiences get together, they begin to talk about their concerns about medications and about alternatives that have been helpful. They build up a kind of group empowerment that begins to challenge the notion of prophylactic medication or medication as the only way to address their symptoms. Many physicians, on the other hand, worry that people who come to them blame the medication for the illness and they fear that stopping the medication will worsen symptoms. These become fairly polarized views and amplify the hierarchical relationship. People feel that if they question their doctors about decreasing or getting off medications, they will be threatened with involuntary hospitalization or treatment. Doctors fear that people are jumping on an unreliable band wagon that will lead to out of control symptoms, jeopardizing the person’s safety. Consequently, talk about medication often goes on without counsel with doctors. In a recovery based environment, more effort needs to be spent focusing on choice and self-responsibility around behavior. If the complaint is that medications control behavior and thoughts while extinguishing all pleasurable, motivational kinds of feelings, there is a need to develop a way we talk about symptoms so that each of us has many choices and options for dealing with them. If I think about early stages of symptoms as driving towards the car wash, there are still many choices I can make before my wheels engage in the automatic treads. I can veer off to the side, stop the car or back up. I am also aware that once my wheels are engaged in the car wash – though it feels out of my control – the situation, based on self observation, is time limited and I can ride it out and will eventually come out on the other side. My behavior, even when I am “white knuckling it” through the car wash, is still my choice and in my control. This kind of process has helped others define triggers, watch their automatic response, develop self critical skills about their own defense mechanisms, and ultimately even ride out the car wash better. Although medications can be helpful in making it through the car wash without ending up in a dangerous situation, there are many more proactive skills that help each of us develop our own techniques, making personal responsibility a more desirable outcome. What Are the Risks and Benefits of Using a “Recovery Vision” for Mental Health Services? Because the feelings and symptoms that have been commonly referred to as “mental illness” are very unpredictable, our health care professionals may fear that we will “decompensate” (a nasty word to many of us) and may put ourselves or others at risk. Health care professionals become fearful that, if they do not continue to provide the kind of caretaking and protective services they have provided in the past, people will become discouraged, disappointed and may even harm themselves. It must be recognized that risk is inherent in the experience of life. It is up to us to make choices about how we will live our lives and it is not up to health care professionals to protect us from the real world. We need our health care professionals to believe that we are capable of taking risks and support us as we take them. More clinicians working in a recovery based environment will enjoy the positive reinforcement of successful experiences in working with people who are growing, changing and moving on with their lives. The recovery focus and the increased wellness of more of us will give health care professionals more time to spend with those who experience the most severe and persistent symptoms, giving them the intense support they need to achieve the highest levels of wellness possible. In addition, health care professionals will find that instead of providing direct care for people who experience psychiatric symptoms, they will be educating, assisting and learning from them as they make decisions and take positive action in their own behalf. These caregivers will find themselves in the rewarding position of accompanying those of us who experience psychiatric symptoms as we grow, learn and change. The implications of a recovery vision for services to adults with severe “mental illness” will be that providers of services, instead of coming from a paternalistic framework with often harsh, invasive and seemingly punitive “treatments,” will learn from us as we work together to define what wellness is for each of us on an individual basis and explore how to address and relieve those symptoms which prevent us from leading full and rich lives. The hierarchical health care system will gradually become non-hierarchical as people understand that health care professionals will not only provide care, but will also work with a person to make decisions about their own course of treatment and their own lives. Those of us who experience symptoms are demanding positive, adult treatment as partners. This progression will be enhanced as more people who have experienced symptoms become providers themselves. Cost effectiveness. As we learn safe, simple, inexpensive, non-invasive ways to reduce and eliminate our symptoms, there will be less need for costly, invasive interventions and therapies. We will live and work interdependently in the community, supporting ourselves and our family members. Reduced need for hospitalization, time away from home and personal supports, and the use of harsh, traumatic and dangerous treatment which often exacerbate rather than relieve symptoms, as we learn to manage our symptoms using normal activities and supports. Increased possibility of positive outcomes. As we recover from these pervasive and debilitating symptoms, we can do more and more of the things we want to do with our lives, and work toward meet our life goals and dreams. As we normalize people’s feelings and symptoms, we build a more accepting, diverse culture. Does Recovery Work Do Anything to Specifically Help a Person Avoid Situations of Being Personally Unsafe or a Danger to Others? With the increased focus on recovery and the use of self-help skills to alleviate symptoms, it is hoped that fewer and fewer people will find themselves in a situation where they are a danger to themselves or someone else. If the symptoms should become that severe, people may have developed their own personal crisis plan – a comprehensive plan that would tell close supporters what needs to happen to ward off disaster. Some of these things might include 24-hour peer support, phone line availability or speaking for or against some types of treatment. These plans, when developed and used collaboratively with supporters, are helping people maintain control even when it seems that things are out of control. While disagreement about any kind of coercive treatment is widespread, the authors, both of whom have been in these kinds of high-risk situations, agree that any kind of forced treatment is NOT helpful. The long-range effects of coercive, unwanted treatment can be devastating, humiliating and ultimately ineffective and can leave people more untrusting of the relationships that should have been supportive and healing. Although both authors feel that all people are responsible for their behavior and should be held accountable, we believe that the development of humane, caring protocols should be everyone’s focus. Treat the person as a fully competent equal with equal capacity to learn, change, make life decisions and take action to create life change – no matter how severe their symptoms. Never scold, threaten, punish, patronize, judge or condescend to the person, while being honest about how you feel when that person threatens or condescends to you. Focus on how the person feels, what the person is experiencing and what the person wants rather than on diagnosis, labeling, and predictions about the course of the person’s life. Share simple, safe, practical, non-invasive and inexpensive or free self-help skills and strategies that people can use on their own or with the help of their supporters. When necessary, break tasks down into the smallest steps to insure success. Limit the sharing of ideas and advice. One piece of advice a day or visit is plenty. Avoid nagging and overwhelming the person with feedback. Pay close attention to individual needs and preferences, accepting individual differences. Assure that planning and treatment is a truly collaborative process with the person who is receiving the services as the “bottom line”. Recognize strengths and even the smallest bit of progress without being paternalistic. Accept that a person’s life path is up to them. As the first step toward recovery, listen to the person, let them talk, hear what they say and what they want, making sure their goals are truly theirs and not yours. Understand that what you might see as being good for them may not be what they really want. Ask yourself, “Is there something going on in their life which is getting in the way of change or moving toward wellness, eg., learned helplessness,” or are there medical problems that are getting in the way of recovery? Encourage and support connection with others who experience psychiatric symptoms. The person who experiences psychiatric symptoms is the determiner of their own life. No one else, even the most highly skilled health care professional, can do this work for us. We need to do it for ourselves, with your guidance, assistance and support. Mary Ellen Copeland has experienced episodes of severe mania and depression for most of her life. She is the author of many books, CDs, DVDs, and other materials. These resources are based on her ongoing study of the day-to-day coping strategies of people who experience psychiatric symptoms and of how people have gotten well and stayed well. She has achieved long term wellness and stability by using many of the coping strategies she learned while writing her books. Mary Ellen has presented numerous workshops for people who experience psychiatric symptoms and their supporters. Ms. Mead is the founder and past Executive Director of three highly regarded peer support service program for persons with serious mental illness. Currently she is the founder of Intentional Peer Support, a peer support organization that teaches and writes about peer support. Ms Mead and her staff are highly experienced in training, staff skill development, administration, management, advocacy, program design and evaluation. In addition to peer support program development, she has been a pioneer in establishing innovative peer operated respite programs that offer an alternative to psychiatric hospitalization. She has pioneered in the establishment of trauma survivor support groups and ongoing education initiatives for mental health professionals and court judges about recovery and parenting issues. For more information: https://www.intentionalpeersupport.org/. Copyright: Plenum Publishers, New York, NY, 2000.